The Old Hag Syndrome is also known as Sleep Paralysis or Isolated Sleep Paralysys. During your REM sleep, dream activity ramps up and the voluntary muscles of the body become immobile. This temporary paralysis keeps us from acting out our dreams and hurting ourselves. Sometimes, though, the paralysis persists even after the person wakes up. You know you're awake and you want to move, but you just can't. Old Hag Syndrome often coincides with hallucinations. In one study, 75 percent of college students who'd experienced sleep paralysis reported simultaneous hallucinations. Sufferers often report sensing an evil presence, along with a feeling of being crushed or choked. That sensation has given sleep paralysis a place in folklore worldwide. Newfoundlanders know it as the 'Old Hag'. In China, it's the 'ghost pressing down on you'. And in Mexico, it's known by the idiom subirse el muerto, or 'the dead climb on top of you'. 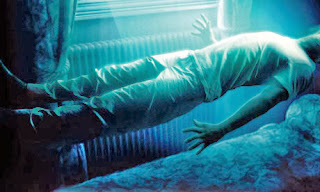 Some researchers suspect that tales of alien abduction may be satisfactory explained by episodes of the Old Hag Syndrome.